Credit: Bart van Overbeeke/TU Eindhoven. Tamoxifen is known world-wide as a blockbuster chemotherapeutic drug for the treatment of breast cancer, but it is not always effective. Before it can exert its healing effect, the patient's body must first convert it into the active component Z-endoxifen. Unfortunately, the conversion depends on the patient's genes, which can lead to a variable therapeutic response in patients. By not administering Tamoxifen but Z-endoxifen directly, this genetic dependence is circumvented and the medicine therefore becomes more effective and less toxic due to lower dosing. This has also been demonstrated by clinical trials in the US. The application of Z-endoxifen had quite a hurdle to overcome: the drug's production was only feasible in small amounts, which led to the exorbitant price of about ten thousand euros per gram. Researchers from TU/e and Syncom have now overcome this hurdle with an improved method to produce Z-endoxifen. During a Bachelor project attentive researchers from TU/e recognized that the HPLC (high-pressure liquid chromatography) purification method used was not at all necessary. Especially on a larger scale HPLC can be particularly expensive. The existing production method yields two variants (Z- and E-stereo isomers) of endoxifen in a 70:30 ratio, of which the latter is undesired. HPLC was necessary to remove the unwanted 30%. The researchers from Eindhoven made the seredipitous discovery that the ratio one step earlier in the process could be increased to 95:5 in favour of the preferred Z-isomer. At this purity a chemical process known as trituration is possible, which enables removal of the the remaining 5% unwanted E-isomer by paper filter, not unlike filtering coffee granules from your morning coffee. The Dutch company Syncom showed this to be the case, andtook the project to the next level by scaling up the production and rendering the synthesis more robust using a tailored protective group on the molecule. Finally, Prof Jos Beijnen's group in Amsterdam proved that this new approach did indeed produce pure Z-endoxifen and that the alternative method of purification is effective. For the next phase of clinical trials of Z-endoxifen, it is important that researchers are able to obtain sufficient quantities of the potential drug at a sufficiently low price. The retail price of pure Z-endoxifen is estimated to be approximately 75,000 euros per gram. 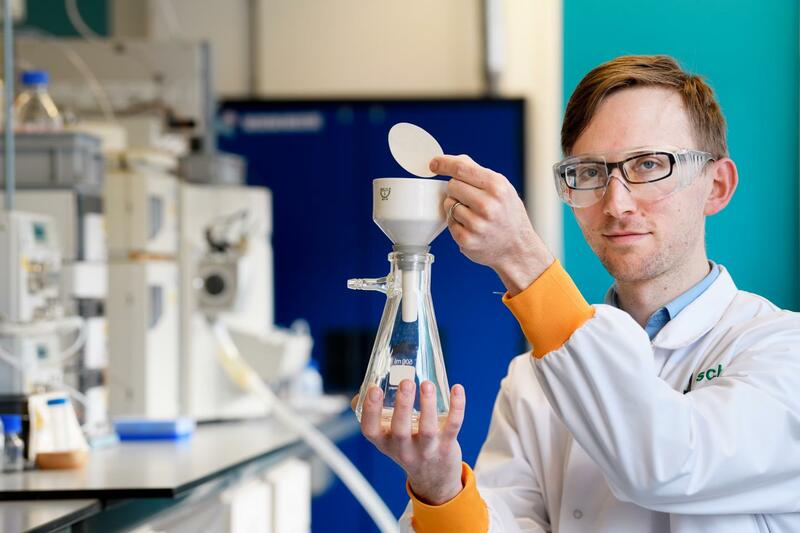 By comparison, the invention from Eindhoven makes it possible to produce dozens of grams or even kilos of high purity at the same time, a lot easier, and at a cost of production that is 1,000 times lower. The big breakthrough means that if medical research groups want to do research into the effects of the drug, they are no longer dependent on expensive producers, but they can now produce the drug themselves and at a much lower cost. Former bachelor student Daphne van Scheppingen worked on the synthesis of Z-endoxifen under the supervision of assistant professor Dr Lech-Gustav Milroy, in 2011. The aim of Van Scheppingen's project was to synthesize 30-50 milligrams of Z-endoxifen for a collaboration with the research group of Prof Jos Beijnen of the Antoni van Leeuwenhoek hospital. At that time, the drug was still in pre-clinical development and still had to undergo clinical testing. Van Scheppingen and Milroy made the discovery through careful inspection of the final steps in an already existing synthesis route. These steps include the purification of a mixture of the synthesis products into the pure substance, and involved a much cheaper and simpler alternative purification method. Since the clinical testing had not yet been completed, the scientific interest in Z-endoxifen was still small. Since the the publication of the clinical trial data, the project has received a new impulse and the work has quickly been published. Bartjan Koning and Jan Koek of Syncom have scaled up the synthesis significantly to dozens of grams. This opens the doors to more research into the activity and selectivity of the cancer medication. In order to make the drug available to patients, the newly discovered production method must be scaled up even further to industrial production (kilograms). The researchers expect that this will require approximately one year of R&D. More research is also needed on the effects of the drug, the so-called Phase II and III, which typically last between 1 and 6 years.